This is a matter to wonder, why there are moles on certain parts and why certain parts of the body is more susceptible to cuts and bruises than other parts. However, this is not all, why should we know the influence of planets on different parts of the body. 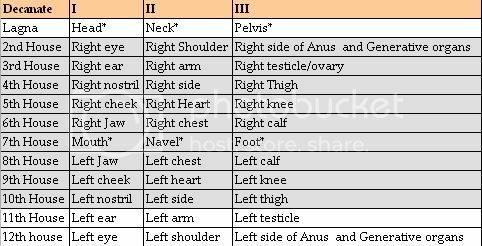 This is a invariable part in medical astrology and can be used to track which planet is influencing the body parts under trouble. Jyotish is a beautiful too to uncover, even those things which are covered in the eyes of a seasoned medical practitioner. This makes us appreciate the association of the cosmos with all of us in this world, whether perceptible or imperceptible to our senses. We are ad midst of the play of the cosmic drama and we are the player. The director is none other than the supreme consciousness, for whom the principle of operation of a universe and a cell inside human body are the same. Alas! We do not realize it with our limited senses. However, we can infer, from whatever we can sense, that there is an invisible reality, which is truer than what we assume to be true in this material plane of existence based on our senses. The three decanates divide the body into three parts. In each sign the decanate where Lagna is placed, would show some part of head (upper part: above the trunk), the 2nd decanate (from that of Lagna Decanate) would show the organs of the middle part (from neck to pelvis) and the 3rd decanate (from that of the Lagna) would show the organs in the lower part (below the pelvis). For illustration if the Lagna is rising in the 2nd decanate, then 2nd decanate of all the signs shall show the part of the head, the 3rd decanate, shall show the parts of the trunk and the 1st decanates of signs shall show the parts of the lower third. a. Lagna: The two side of the Lagna cusp represent two sides. From the beginning of the Lagna sign (0deg) to the cusp falls in the visible half and shall represent the left side of the body part and from the cusp to the end of the sign falls in the invisible half and shall represent the right side of the body part. b. 7th house: In the seventh house, the duration of beginning of the sign to the cusp of the 7th (equal to Lagna cusp in equal house division) falls in in the invisible half (already set in western horizon) and shall represent the right side of the body part and from the cusp to the end, falls in the visible part (yet to set in western horizon) represent the left side of the body part. In the following illustration, Saturn is placed in the 7th house however is in the visible half (cusp to end) of the 7th house and hence shall represent the left side of the body part. Saturn is placed in the 3rd decanate of 7th, which represent foot (since Lagna is in 1st decanate, the head is ruled by the 1st decanate, the torso by the 2nd decanate and the part below the navel by the 3rd decanate). Thus the body part influenced by Saturn is left foot. Thus it is noteworthy that the visible part of the zodiac at the moment of birth (from 7th to 12th) show the left part of the body (controlled by right side of the brain), while the invisible part of the zodiac (Lagna to 7th) shows the right side of the body (controlled by the left side of the brain). Thus one should remember the association - Visible- Left; Invisible - Right. The above mentioned body parts can have some moles or scars based on whether it is occupied by benefics or malefics. I have for sure wound marks or scars in my left knee where Mars is placed. I always used to think, why am I so susceptible to wounds and bruises in my left knee when I was a naughty kid, whereas my right knee is perfectly fine. Saturn is also not lesser in anyway in inflicting its pain and marks in left foot. Dear Sir, I could not understand the effect when asc is not in first 10 degrees should we shift the asc to 0.01 degree in the sign and do accordingly?? Hi, can you post these Cancer links for me from here? is a great site for reference. "These Skin Cancer Mole Pictures are pretty gross but they need to be shown." "People need to see this stuff so they can avoid skin cancer." Thanks!